This can be quite a time saving tip. If you want to create copies of an object, rather than using the Copy command, try this technique instead. In Fig.1, I have drawn a polyline to help demonstrate the copying process using this object. Draw an object similar to the one on Fig.1. 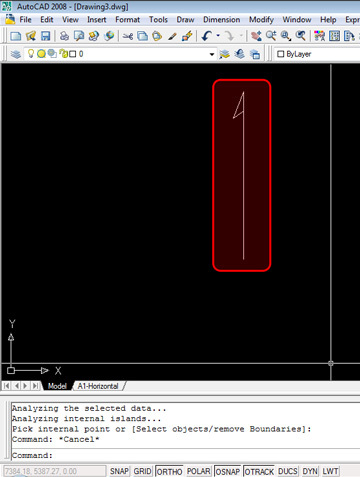 Select the polyline object you just drew. Once selected, there are bluse squares that appear on the object. These blue squares are called grips. Point 1 in Fig.2 shows one of the grips as red. This is called a "Hot Grip" and we can enable this by Left Clicking on one of the blue grips. Note: You can select many grips at one time to have multiple Hot Grips. To do this, hold the SHIFT key then Left Click on all the grips you want to enable them as a hot grips. 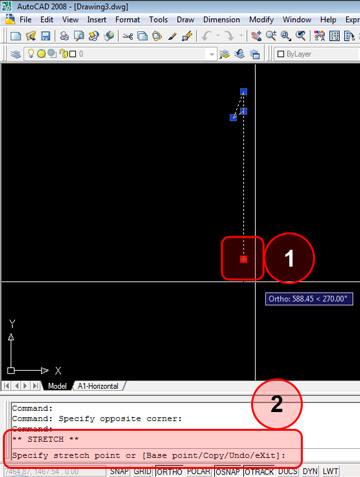 After enabling the Hot Grip, look at Point 2 Fig.2 showing the command prompt. The word ** STRETCH ** appears. Whenever you enable at least 1 Hot Grip, AutoCAD starts a cycle of commands that you can scroll thorugh by pressing the ENTER key or SPACEBAR. The first of these commands is the Stretch command. We start with Stretch, then MOVE, ROTATE, SCALE, MIRROR and then back to STRETCH again. 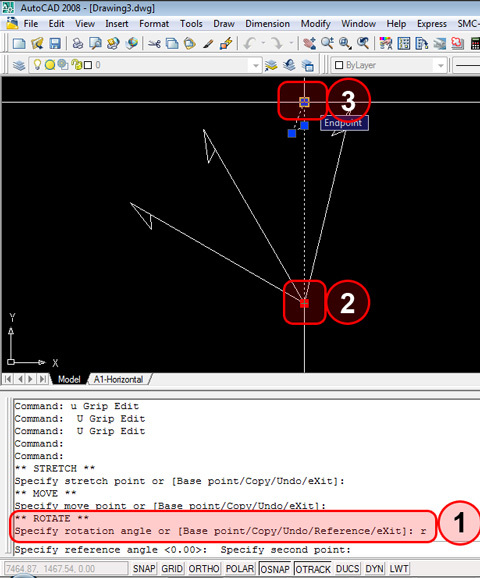 AutoCAD will continue to repeat this order of commands as a part of the cycle. In Fig.4, I have invoked the MOVE command in the cycle. If I want to Copy multiple objects, I type C (Point 2) then press the ENTER key. This tells AutoCAD we want to MOVE copies of the selected object. 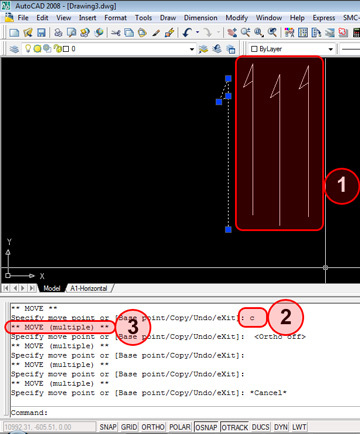 Point 3 shows that we are now creating and moving Multiple copies of the object until we press the ENTER key or SPACEBAR. Delete all the objects we just created except one. Select the object and make a Hot Grip as we did earlier. Now press the ENTER key or SPACEBAR until you cycle through the commands and reach ** ROTATE **. Press the C key and press ENTER or SPACEBAR. We are now ready to ROTATE copies of our object. You can either Left Click on places you want to rotate to or you can enter degrees too to make the object rotate to specific degrees just by typing the degrees angle (e.g type 30 for 30 degrees). Now you may have noticed freely clicking isn't very accurate. The rotate command rotates at 90degrees to the object. To get around this, after making a hot grip and cycling to rotate command, type R then ENTER or SPACEBAR (Point1 - Fig.5). This allows us to specify a Reference point. I haven't explained the Stretch, Mirror or Scale commands using this method but the method is the same as explained for Move and Rotate.